As part of #SLUWeek here at A10 Talk, we spoke with Bobby Stilwell, recent graduate and former beat writer covering Billikens basketball. We wanted to know Bobby’s thoughts on next year’s team and the SLU program in general. Be sure to give Bobby a follow on Twitter! A10 Talk: Talk to us a bit about your affiliation with SLU. When did you become a fan, what are some of your past engagements with the basketball program, etc.? Bobby: Been a fan of SLU Men’s Basketball for as long as I can remember (I live close to St. Louis and went to a game when they still played at the Enterprise Center in 2006 or 2007). My passion for all the other sports came along throughout my time as a Billiken (Class of 2018). Of course, I never expected to spend my junior year as a beat writer and senior year as sports editor for the campus newspaper. 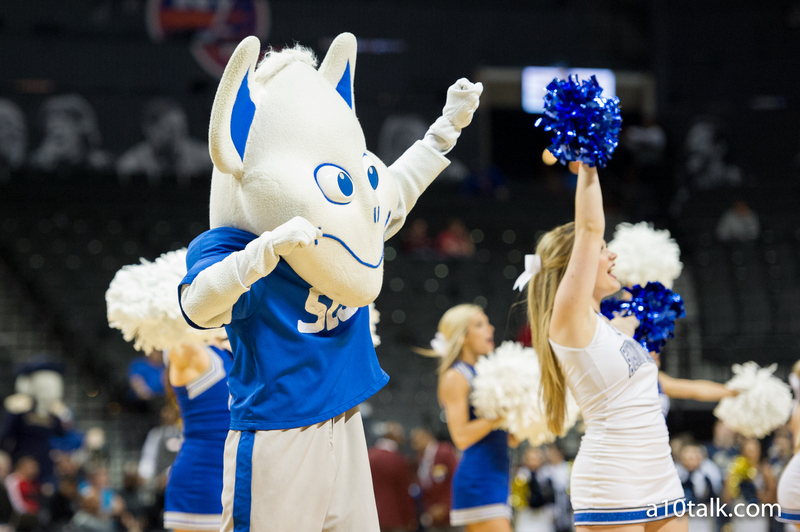 A10 Talk: Expectations are sky-high for the Billikens this season. Do you believe the hype? Is this team ready to win the A-10 for sure? Bobby: SLU was in postion to win the A-10 last year before Title IX reared its ugly head. Despite the loss of Jermaine Bishop, Adonys Henriquez, and Ty Graves to Title IX and the transfer of Jalen Johnson and de-commit of Mickey Pearson, SLU has plenty of depth. If Ford can get a rotation going with just six players, imagine what he can do with a full bench. A10 Talk: It’s hard to forget some of the fun SLU teams that had success in the NCAAT just a few seasons ago. What’s it going to take to get back to that consistent success, and does Ford have it in him? Bobby: With Ford’s ability to engage the SLU and St. Louis community at large, fans won’t be disappointed if they head on over to Chaifetz for a game. If you think the few games last year where the student section was full were amazing, just wait until this season. I know plenty of people involved with SLUnatics (used to be on E-Board until I left the organization in November 2016). To get back to consistent success in Midtown, Ford needs to keep recruiting (which he’s mastering already) and bringing amazing talent to the court. If he can do this, another trip to the Round of 32 (maybe even further) isn’t out of the question. A10 Talk: SLU has quite a few newcomers this year. Who’s your favorite, and who’s the biggest sleeper in your opinion? Bobby: Out of this year’s class, my favorite player has to be Carte’Are Gordon. Despite his suspensions at Webster Groves, he can perform on the court. Get ready for plenty of Rammer JAMTIME! calls with him on the court. DeMarius Jacobs comes in as the sleeper, but I think he’ll prove himself quickly off the bench. A10 Talk: What non-conference game(s) are you most looking forward to? Can SLU enter league play with less than 2 or 3 losses on its resume? Bobby: By far, I’m looking forward to the FSU and Pitt games. Wins in those games are going to only help SLU get an at-large NCAA Tourney bid in the very unlikely event they don’t take home the A-10 trophy this year. It’ll be tough, but Ford’s proven that he can bring up great leaders on the court in the worst of times. With this year’s roster, I think SLU will easily make it into conference play (even with the late start) with under 3 losses. A10 Talk: Who’s going to be the biggest impact player this year and why? Bobby: Biggest impact player this year is going to be Jordan Goodwin. I think we’ll see at least a pair of triple-doubles from Goodwin. The partial season we got with him last year was incredible and got Chaifetz rocking (to quote Ford in his interviews). A10 Talk: If Saint Louis makes the NCAA Tournament, are you going no matter what? Bobby: As for going to the NCAA Tourney, I wish I could do it, but in small town TV weather, vacations (and money) are hard to come by..
Bobby: I really think Davidson will contest with SLU for the top slot of the A-10. They’ve got a lot of talent returning, but even veteran talent can sometimes get outpaced by young guns. A10 Talk: Finally, is this the start of something great at SLU? Ford has had plenty of recruiting class, and it’s time for all of the pieces to come together. What’s your outlook for this team, say, 5+ years into the future? Bobby: 5+ years into the future, I could easily see SLU in the NCAA Tourney twice, a pair of A-10 regular season and Tourney titles, and Chaifetz Arena packed every night there’s a game. SLU just needs to steer clear of anything and everything that could result in player suspensions…or worse.